← We are Tennessee Bound! This week I was chatting with a friend who will be moving this coming week. He and his family are on a faith journey very similar to ours. He and his wife build my faith each time we chat and I’m so thankful to walk out our faith journeys together! As he and I were chatting this morning, I told him that I don’t know how to do this whole thing because it all just feels so different. Let me explain. I have been known to be a planner. I have been known to charge forward and make decisions. However, this time my role is simple. I need to pack up our house, load the moving truck, drive the van to Maryville, TN, unload the truck, and create a home once we are there. Ok, it’s not as easy as I make it sound, but there could be A LOT more to do. If I didn’t have a firm faith that God was in this whole move, I could add worry, doubt, fear, questioning, depression, and many other actions and feelings to my to-do list. In so many ways, my position in life has changed. While in the past, these things would drive me, they don’t now. 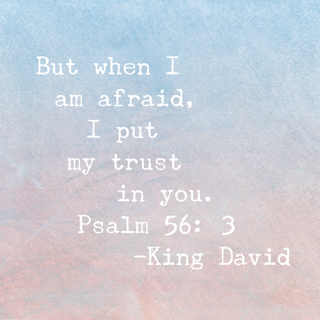 I trust God. I trust my husband. I trust that everything will work out. This trust fall is the biggest I’ve ever experienced and yet I’m not adding any of those things to my list. Many people have asked if I’m excited and often I don’t know how to express what I’m feeling. Yes, I’m sure I’m excited but more than anything I’m simply settled. I’m resolved that God has this. I’m resolved not to worry or fret. I’m resolved to pray and trust. I’m resolved to be who God created me to be without any worry of being enough. I’m not trying to be arrogant about this, I’ve just believe I’ve found the faith zone. That spot where you trust, pray, and live without worries. Notice trust is first. I can’t pray with a faithful heart if first I don’t trust God. My prayers will be fear-driven if I do that, when I want them to be faith-driven. I am determined to stay in the faith zone as we move forward with God’s plan. It’s all about keeping my eyes on God and staying connected to Him with prayer and studying the Bible. Those actions will build faith and trust and keep me from worries. I hope you all have a faith filled week!